Are trucks getting too similar? Think back to the 1980s and 1990s when we had so many more truck makers. Not only that, there were so many different engines and gearboxes. 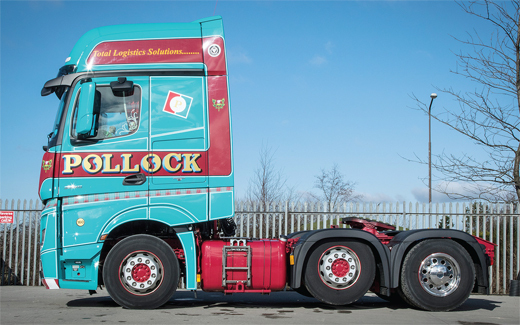 Today, technology has advanced to the point where there’s an almost standard specification for a long-haul 44-tonne tractor unit: midlift 6×2 configuration, around 450 bhp, automated gearbox, and as large a living environment as possible. On paper, these two trucks are almost identical. But to drive and live with them, you’ll find each manufacturer has infused its own spirit and personality into the vehicles, and each one is unique. We have an old favourite in the DAF 106 XF Super Space and the upstart from Stuttgart, the Mercedes-Benz Actros MP4 GigaSpace. The latter was released at the end of Euro 5 in 2012 as an all-new truck, while the DAF was treated to a comprehensive update for Euro 6. 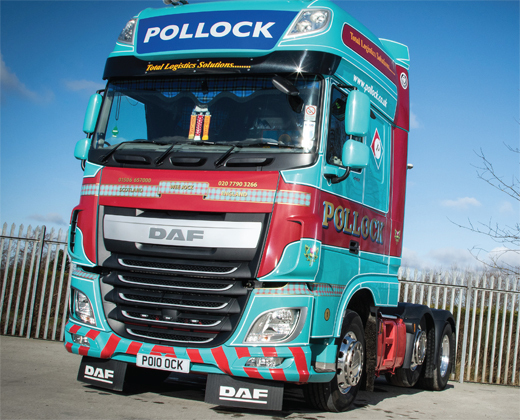 The trucks are run by Pollock Scotrans Ltd, which is one of the longest established (it’s their 80th anniversary this year) and most instantly recognisable fleets in the UK. The drivers of both these trucks are full-time trampers, spending the entire week on the road. 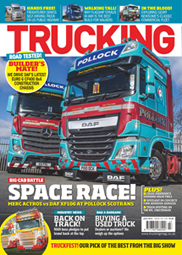 So, in this fiercely contested sector, we’ve got a big company looking for maximum efficiency and reliability, and drivers who need a truck that’s as good to stay in when parked up as it is to be behind the wheel.